The existing cadestral maps are digitized and map corrections, issuance of certified copies of maps are now possible through the software called “Bhu-naksha”. 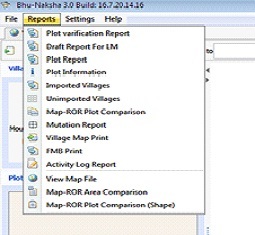 Bhu-naksha is cadastral mapping software developed by NIC using Open source applications and libraries to facilitate management of digitized cadastral maps village-wise and for the integration of textual data on land records with the spatial data. 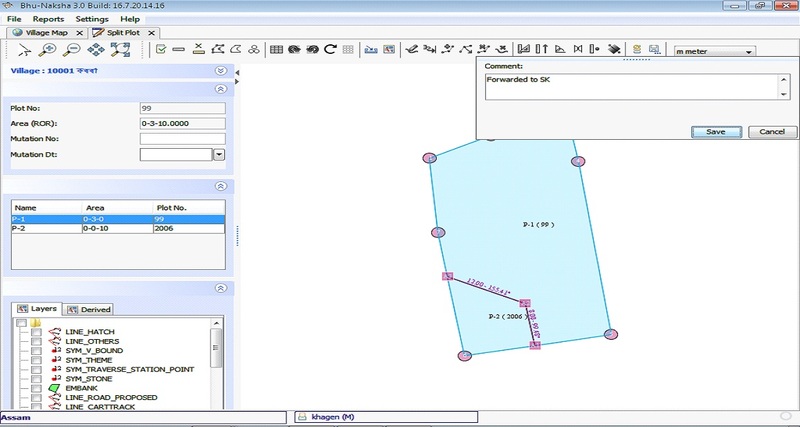 This document outlines detailed requirements for cadastral mapping solution and the integration of ROR and cadastral maps under NLRMP. 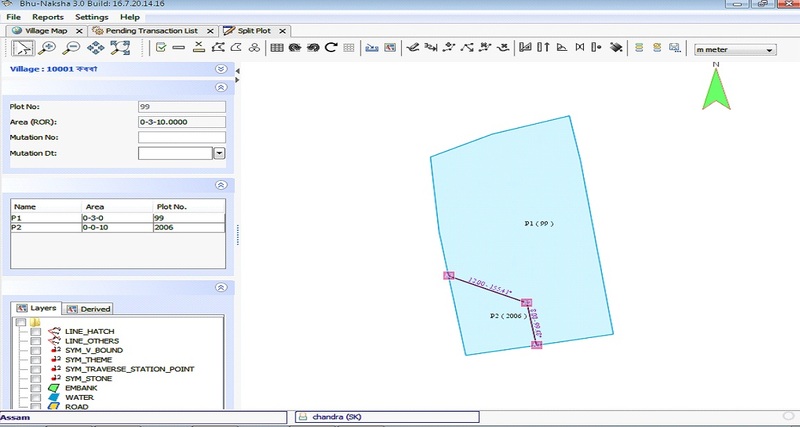 The scope of the system is to facilitate end to end solution for cadastral mapping starting from digital verification of raster and vector data of cadastral maps, its integration with Records of Rights (RoR) and services such as mutation, partition, updation, distribution of RoR and map covering the requirements of DILRMP project in G2G and G2C domain. 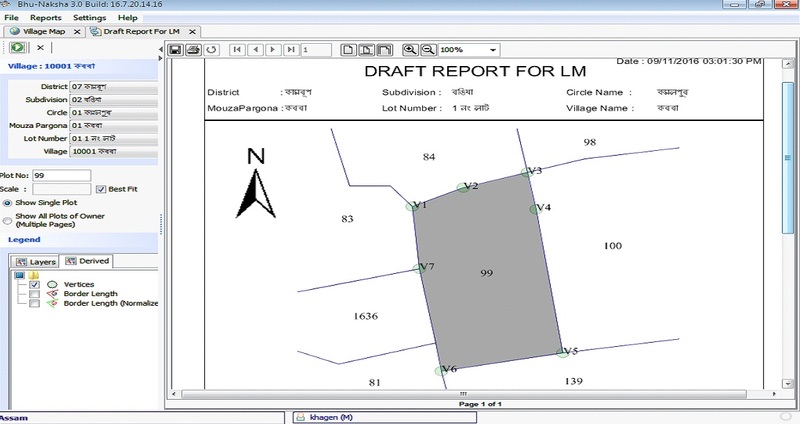 At present, cadastral maps are maintained within village boundaries with proper village index defining association, direction and orientation among plots constituting the village. 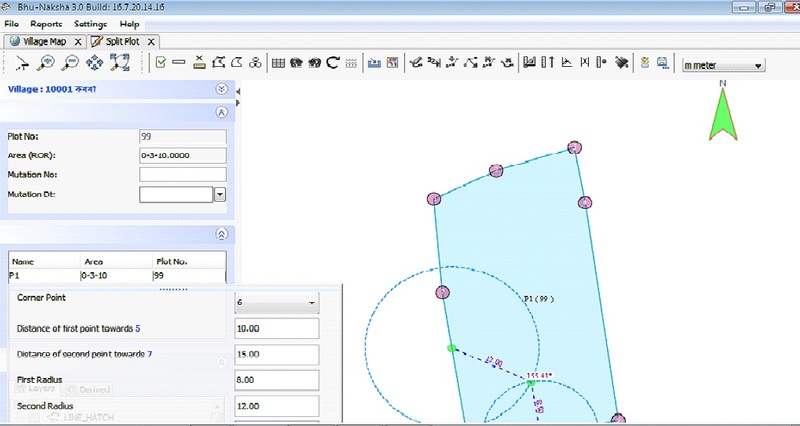 Developed using Free and Open source software. Works in both Windows and Linux O.S.s. Web, Desktop and Mobile apps available. Responsive web rendering for smaller screens. A plot can be divided into multiple subdivisions in a single partition. Multiple methods for division of a plot and updation of Maps. 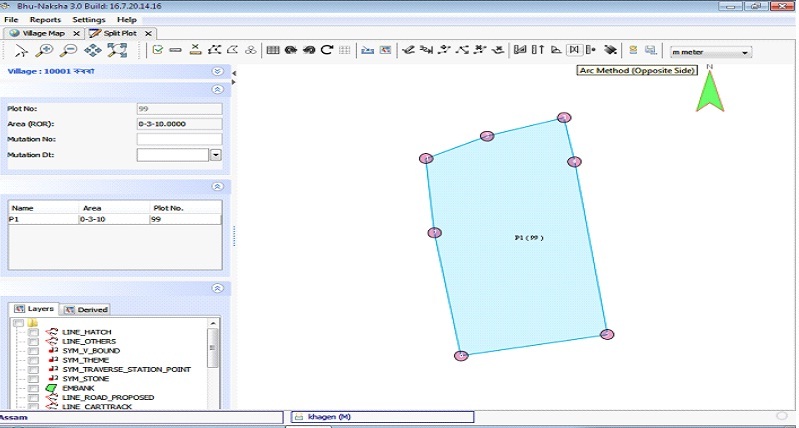 Grid and Background image can be used to help in drawing division lines. 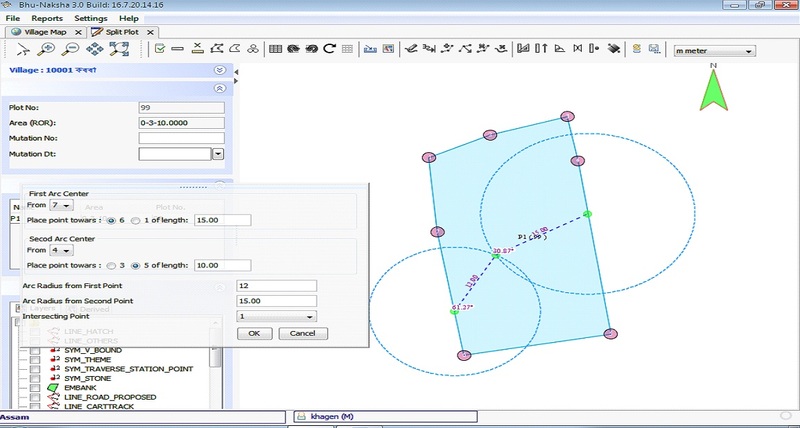 Multiple plots can be divided in a single operation for cutting road/canal etc. Vertex / Vertices: In the fig 1, Say ABCD is plot. A, B, C, D are the vertices. In Bhu-naksha we also call it as reference points. 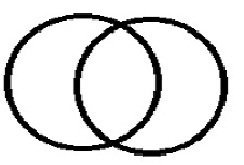 Adjacent Sides: AB & BD or BD & DC or DC & CA are the adjacent sides. Opposite Side: AB & CD or AC & BD are opposite sides. Arc of a Circle: Here Portion/part of a circle. Point of Intersection: Here where two circle meets. 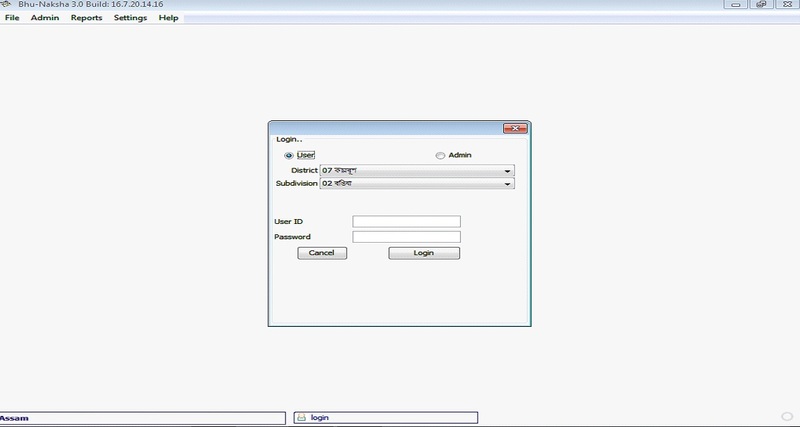 Log in Screen : Login with Dharitree user ID & Password. 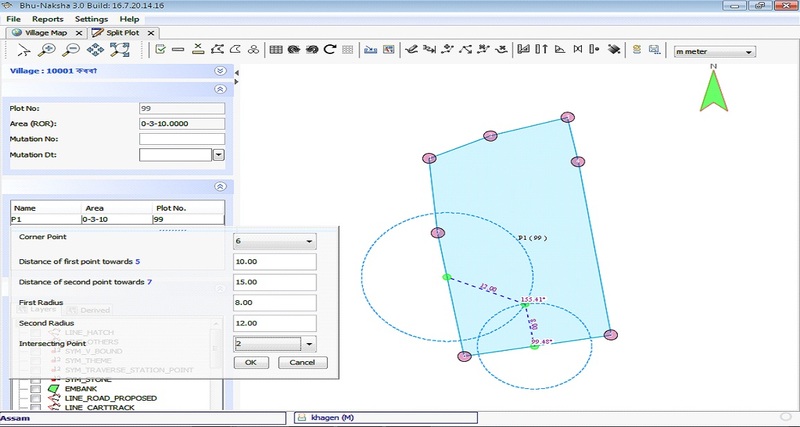 Put the Dag/plot No here & Select the option vertices from Derived option and press Run button. You will get the Draft Map with vertices as shown below. 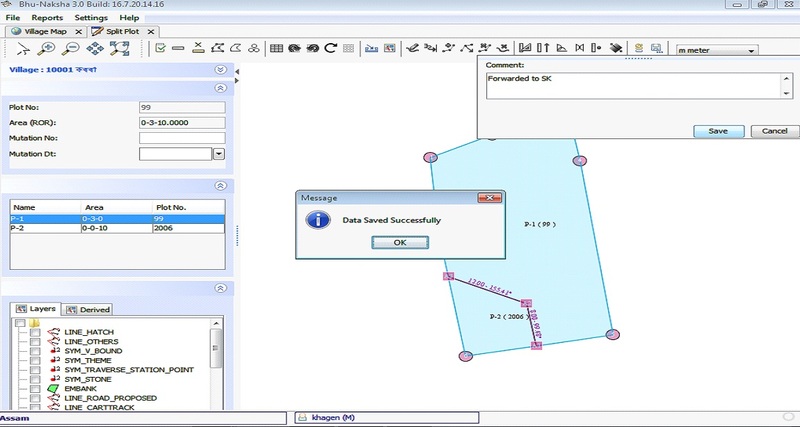 Consider the Manual Map prepared using Draft Report for LM. How to draw the Arc as shown above? As per manual maps we have to draw a point (First point) which is 10 m from vertices 6 towards vertices 5. Draw a Circle from First point with a radius of 8m and draw another circle from second point with radius 12 m. The two circle will meet at two different point (Point of Intersection) as shown above. Now consider the point which is as per your manual map. Now save the file by choosing the option Save button and forward the same to SK by putting comment in the Comment box & then press Save button. Procedure of Arc Method ( Opposite Side ) is same as Arc Method ( Adjacent Side ). The only difference is that You have consider Opposite side instead of Adjacent side while splitting. 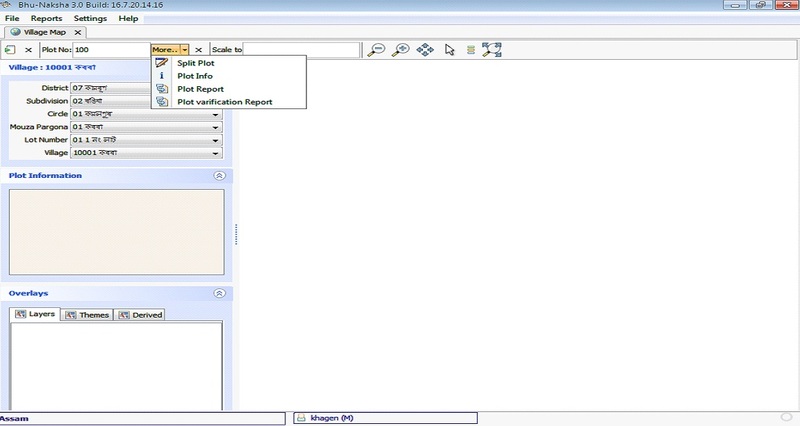 Step 2: Select the option Pending Transaction List from File Option. Now there are Four different options like Forward, Send back, Edit/View and Close. SKs main task is to view the Map forwarded by Lot Mondal and if satisfied forward the same to Circle Officer and if not satisfied send back the same to Lot Mondal with a comment in the comment box. Edit/View: This option is used to view the map. 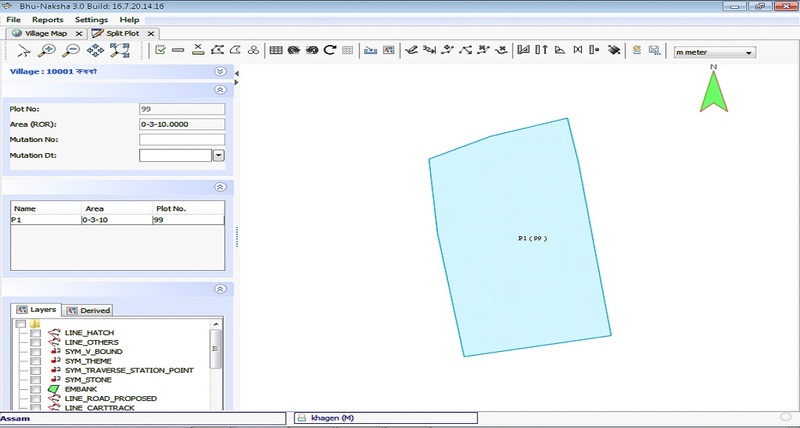 One can view the map by clicking this option and get a new screen as shown in fig below. To close the screen select the close (x) option. Forward: This option is used to forward the map to Circle Officer. 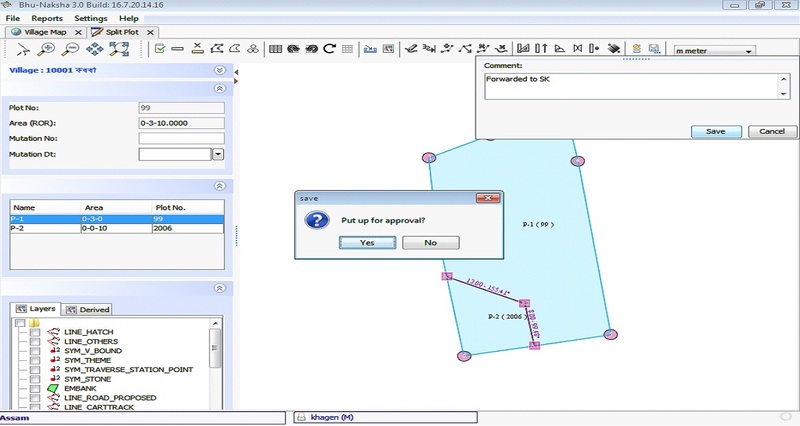 Send back: This option is used to send back the Map to Lot Mondal again. After viewing the Map, if SK is not satisfied or found anything wrong in the Map, he/she can send back the same to Lot Mondal mentioning the details in comment Box. 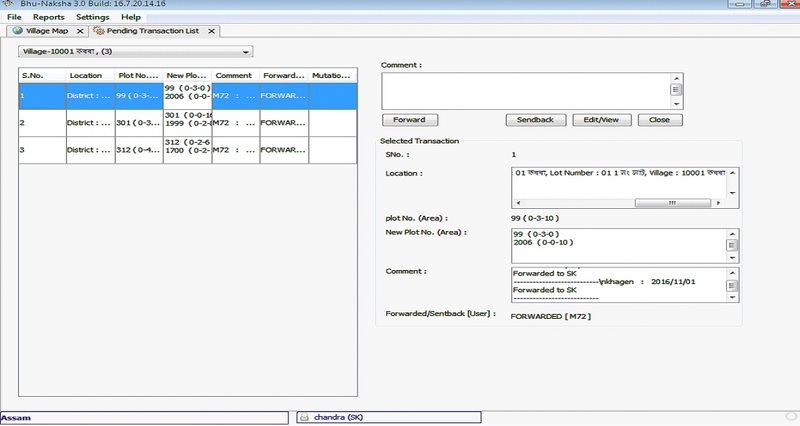 Close: This option is used to close the Pending Transaction list Screen.